Partly cloudy. Low around 60F. Winds SE at 5 to 10 mph.. Partly cloudy. Low around 60F. Winds SE at 5 to 10 mph. 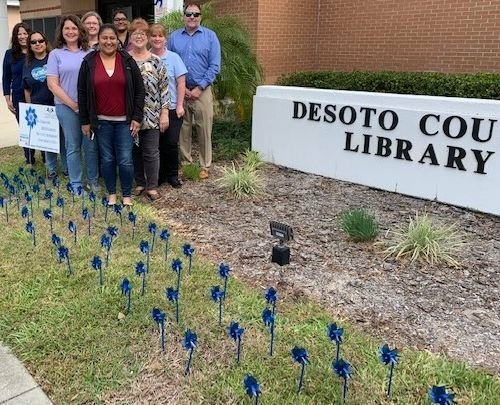 Various local child welfare agencies decorate the DeSoto County Library in blue. Included are the Department of Children and Families, the Guardian ad Litem Program, Healthy Families, and the Early Learning Coalition of Florida’s Heartland. 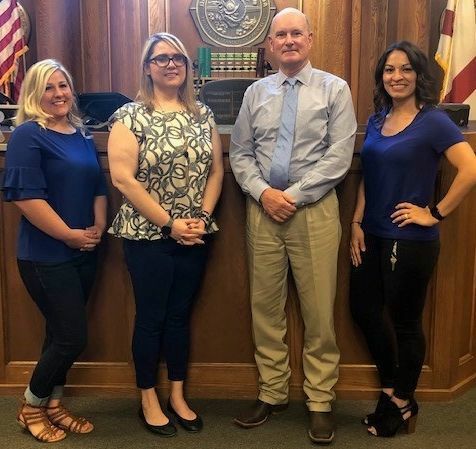 Wearing blue are Judicial Assistant Magan Iglehart (left), DeSoto County Judge Danielle Brewer, Circuit Judge Don T. Hall, and Judicial Assistant Anita Collins. Participating by wearing blue are the Guardian ad Litem Program staff and volunteers, the DeSoto County Clerk’s Office, the Circuit Family Division Support Worker, Judge Danielle Brewer and Judicial Assistant, and the State Attorney’s office. April is National Child Abuse Prevention Month and is represented by a blue ribbon. This month and throughout the year the Guardian ad Litem Program encourages all individuals and organizations to play a role in making DeSoto County a better place for children and families. By ensuring that parents have the knowledge, skills, and resources they need to care for their children, we can help prevent child abuse and neglect by creating strong and thriving children, youth, and families in our communities. Currently, the DeSoto County Library is displaying information to aid families in growing stronger. Please visit the library in April for more information. For more information about volunteering locally, contact the Guardian ad Litem Program at 863-993-4638 or at www.12gal.org.